Prosecutors ask for the death sentence for ousted Islamist Egyptian president and other Muslim Brotherhood leaders in espionage trial. Egypt's state news agency reported on Wednesday that prosecutors have asked for the death sentence for ousted Islamist President Mohammed Morsi and other Muslim Brotherhood leaders on trial on espionage charges. According to The Associated Press (AP), prosecutor Emad el-Sharawy said in closing remarks that Morsi and his aides leaked state security documents to foreign intelligence agencies, namely Iran, while in office for one year. The military removed Morsi from office in July 2013 following mass protests against him accusing him and the Brotherhood of monopolizing power. El-Sharawy said the defendants, who include Brotherhood leader Mohammed Badie and 34 others, cooperated with terrorist groups, including Gaza's Hamas, to destabilize Egypt. 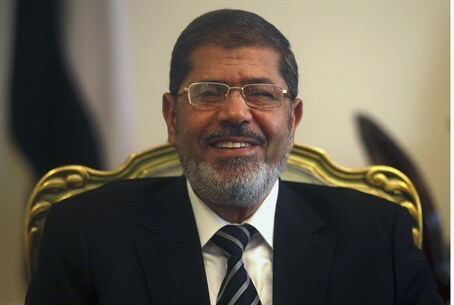 Morsi told the court he refused its jurisdiction. He asked to defend himself in upcoming sessions, according to AP. The case resumes on November 26 for closing defense remarks. The trial in question is one of several against the Islamist former president. In one trial he is being accused of inciting the killings of opposition protesters outside the presidential palace in December 2012. Another of Morsi’s trials, which began in January, cites his role in a 2011 jailbreak which saw the deaths of several police officers. A fourth trial will be held over charges of insulting the judiciary. More recently, Egypt charged the ousted president and several other people with endangering national security by leaking state secrets and sensitive documents to Qatar.